Reservations required as space is limited, call 245-3678 ext 2542 to reserve. Suggested $3 donation to assist Kōloa School. 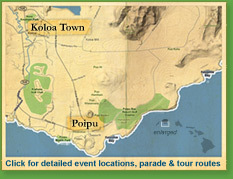 Visit the area where the Hawai‘i sugar industry got started. Arryl Kaneshiro of Grove Farm will share historical information regarding Kōloa Mill and a former McBryde Sugar Company employee, Earl Smith, will also be on hand to “talk story” about plantation life. The tour will encompass a visit to view the exterior of the Kōloa Mill and will include a ride to Waita Reservoir and the Wilcox Tunnel. Reservations required as shuttle seating is limited. Admission: Free. Donations welcome. All proceeds benefit Koloa Elementary School.